Another day, another federated database. The latest offering is JISC MediaHub, which is a bringing together of a number of digital multimedia resources, many of which have been made available individually to UK higher education users by the Joint Information Systems Committee, often under institutional subscription only. Edinburgh University’s EDINA are the people who have put it all together, though all of the original digitising, describing and contextualising has been done by other hands. The resources include Film and Sound Online, NewsFilm Online (previously reviewed by the Bioscope), Spoken Word, Getty, AP Archive and several more. JISC MediaHub brings all these together in one searchable form, allowing you to refine searches by video, image or sound (the three types featured), and by restricted or unrestricted content – so some of the content is open to all. It is clear to use, though personally I find the design on the busy side and the way descriptions pop up to the side of records a bit off-putting. Further tools and features are promised with later releases. MediaHub began in 2005 as a portal project entitled Visual and Sound Materials and has take quite a while to get to this form. It is to be hoped that it achieves its aim of increasing scholarly use of audiovisual media by making it easier to find high value content all in one place, rather than a set of disparate services. Whether researchers need (or, let’s face it, deserve) to find everything handily in one place is a matter for debate, but that’s the way things are being pushed – so it’s not really up for debate at all. You have all the advantages of the one-stop-shop, and all the disadvantages of content taken out of its curated context (though MediaHub does point researchers back to the original source website). So, what can we find for our area of silent films, either among the restricted content (if we’re in a subscribing UK higher education institution or have password access to some other sites) or unrestricted (the rest of you)? Well, there’s quite a lot. Under content restricted to educational users only, there is a significant number of films from the Imperial War Museum covering the First World War, including the feature films The Battle of the Somme, The Battle of the Ancre and the Advance of the Tanks, and The Battle of Arras, along with other documentary and propaganda films made by British official film outfits. 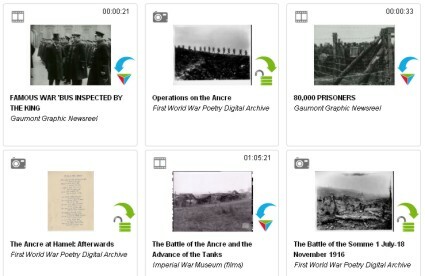 There are also IWM film clips which are available to all included on another resource, the First World War Poetry Digital Archive. 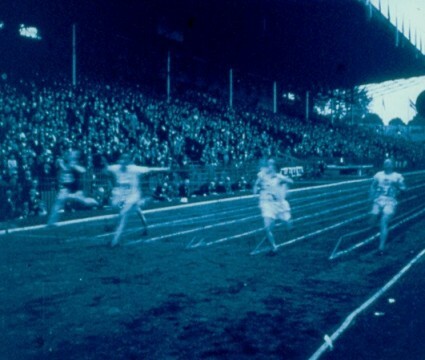 There is a considerable amount of news footage from the ITN collection (NewsFilm Online, originally created by the British Universities Film & Video Council), which includes practically the entire surviving archive of the Gaumont Graphic silent newsreel (1911-1932), with its marvellously rich recod of life, events and manners over two decades. There are also silent films on medical subjects in the Wellcome Trust collection, including the renowed War Neuroses, on the treatment of shell-shock (see the earlier Bioscope post on this), and titles such as Frontal Rhinoplasty and Epidemic Encephalitis, which you tend not to find in standard silent filmographies. Among the unrestricted content there is the Open Video Project, itself a collection of freely-available online video collections which include a number of early Edison productions (and reviewed previously on the Bioscope); and Culture Grid, a collection cultural objects from UK collections with many photographs that relate to cinema – particularly cinema buildings themselves (type in ‘cinematograph’, ‘bioscope’ or ‘electric theatre’ for some interesting results, such as the image at the top of this post). There is much more on film outside of silent film. Among the restricted collections are the ETV collection of Soviet and left-wing films, social conscience documentaries and feature films from Amber Films, the Films of Scotland series of documentaries, clips from the Getty collection of stock footage, news footage from Associated Press, and films on archaeology, medicine, chemistry etc., with other collections under negotiation, notably the Royal Mail Film Classics collection (Night Mail and such like). Among the film content that is free to all there is ARKive (footage of endangered species). All in all it’s a remarkable, if equally curious collection of stuff. There are hundreds of thousands of objects available (around 90,000 being film items), but the randomness of some of the collections gives a sense of lucky dip about the whole research process. You don’t know what you are going to find – and if you are looking for something specific you’re as likely to be disappointed as not – but what you do find is bound to intrigue, and hopefully to encourage scholars to come back for more. The great advantage for those in UK HE is that the restricted content is licensed for them to download and re-use, and that (I can tell you) has taken a lot of neogiating to achieve, and not a little expenditure as well. For the rest of us, it’s a bit like peering in at the window of a toyshop when you haven’t got any pocket money. It would of course be so much better of all of this content was freely available to everyone, to do what they wanted with it in an entirely open fashion. But that’s not going to happen (yet), and much of this content has only been made available in this way because it can be restricted to educational users under careful licence conditions. So lucky you if you’re a UK student. Now go out and make use of it. It took a while before I saw why you put that postcard from Derby at the top of your blog. 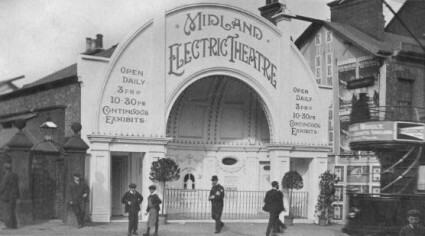 The Midland Electric theatre has a double vertical sign to the right of the building which reads: KINEMACOLOR. Any idea when they have made the photograph?